Michael Podlin lost his battle with pancreatic cancer after a long hard fight of two and a half years. 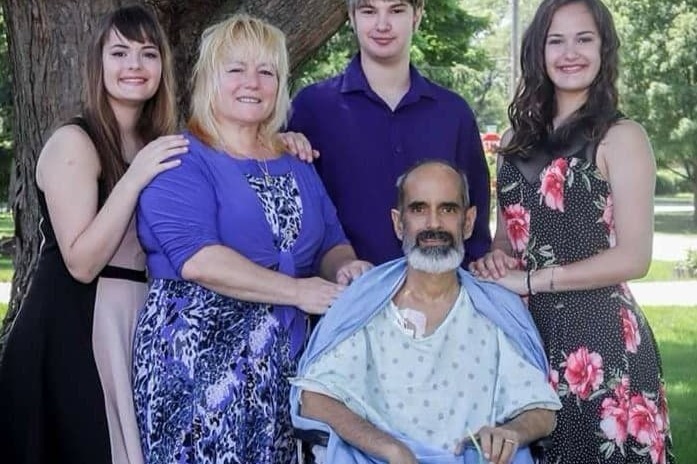 He has left behind his wife TammySue Margalit and three teenage children. TammySue was a housewife without a job and has a freshman, junior, & senior in high school. Michael and TammySue have always been giving , be it food pantry, neighbors, friend hitting hard times, family, even strangers in need. They have been part of the Halloween community in the Arlington Heights and surrounding area for the last 17 years. Even while fighting the cancer with chemotherapy and feeling awful, Michael was still creating new props and new ideas for this coming years display. Michael was a man of few words. He expressed himself through his creations for the community Halloween display with NO CHARGE EVER! His reward was seeing the joy the haunt display brought to literately thousands of people who came through every year. Many came year after year to the changes as it grew larger even to be as exiting as some Disney displays. They hope to continue this tradition year after year in honor of the great battle Michael fought so bravely. With the amount of bills from 3 hospitals NOT everything was covered leaving a LARGE amount owed to dozens of doctors, the daily routines of food, mortgage, utilities, school, clothes and so many other essentials needed, and two kids getting auto license so they may start jobs to pay for their own college, with so many repairs needed from their home that flooded 2 months ago, with so many other repairs needed for their home including no A/C for 15 years, unfinished walls & with the hope of putting up the best Halloween display this year for the Arlington Hts community they hope to raise money for a little family relief until TammySue can get back on her feet and get a job.